Physical Preparation Scriptures for Christians that I denounced. Nor the solar eclipse of 2017, which I also denounced. Nor will it be in 2018 or 2019, despite certain current and old non-biblical prophecies (see also When Will the Great Tribulation Begin?). Does this mean that Christians should not be prepared? Here is a link to a related sermon: Physical preparedness for Christians. "Go to the ant, you sluggard! Consider her ways and be wise, Which, having no captain, Overseer or ruler, Provides her supplies in the summer, And gathers her food in the harvest. How long will you slumber, O sluggard? When will you rise from your sleep? A little sleep, a little slumber, A little folding of the hands to sleep--So shall poverty come to you like a prowler, And your need like an armed man" (Proverbs 6:6-11). 15 "Laziness casts one into a deep sleep, And an idle person will suffer hunger" (Proverbs 19:15). 3 "The LORD will not allow the righteous soul to famish" (Proverbs 10:3). 5 "He who has a slack hand becomes poor, But the hand of the diligent makes rich. He who gathers in the summer is a wise son; He who sleeps in harvest is a son of shame" (Proverbs 10:4-5). So, the Bible speaks well of those who gather in the seasons when they can. You are not just to sit around and expect others to take care of you. In modern times, paperwork may be helpful as well. 25 And as they bound him with thongs, Paul said to the centurion who stood by, "Is it lawful for you to scourge a man who is a Roman, and uncondemned?" 26 When the centurion heard that, he went and told the commander, saying, "Take care what you do, for this man is a Roman." 27 Then the commander came and said to him, "Tell me, are you a Roman?" 28 The commander answered, "With a large sum I obtained this citizenship." And Paul said, "But I was born a citizen." The centurion bought a citizenship, which he felt would help him. Paul was basically born a dual-citizen and was able to use that to his advantage. In modern times, having documentation of such things could be helpful for some. 3 "A prudent man forsees evil and hides himself, But the simple pass on and are punished" (Proverbs 22:3). 43 "But know this, that if the master of the house had known what hour the thief would come, he would have watched and not allowed his house to be broken into. 44 Therefore you also be ready, for the Son of Man is coming at an hour you do not expect. 45 Who then is a faithful and wise servant, whom his master made ruler over his household, to give them food in due season? 46 Blessed is that servant whom his master, when he comes, will find so doing" (Matthew 24:43-46). 12 "gather His wheat into the barn" (Matthew 3:12). The Bible endorses saving and proper planning. Thus, people who believe the Bible will take steps and not ignore what is happening today. Back in 1999, as far as y2k went, I remember a relative who asked me about it in December of that year. He had bought some canned foods earlier for y2k, but had already eaten them. He asked me what to do. I told him that while nothing major was likely to happen on January 1, 2000, that he should again buy some canned food. I asked him, what is the worst that would happen if no significant y2k event would occur. He responded that he would have some canned food that he would eat anyway. So, I told him that I saw no downside in him buying some canned food. He did, nothing of massive importance happened with y2k, and he ended up eating the food. Before going further, let me state that accumulating some financial savings is a sound idea. While you may feel that you are too poor to save anything, let me state that if you do not make efforts to save you will essentially have to always remain poor. Do not accept that mindset. God's intent is not that His people be always physically poor. Yet, many people do not have the faith to give. Consider also, in the parable of the virgins, the wise are prepared and rewarded, but the foolish are unprepared and turned away (Matthew 25:1-13); while is is true that this parable (and the other scriptures quoted) have spiritual meanings, it does suggest that Christians should also be prepared physically. Some do not think there will be a problem because things seem to be the same. Is that the acceptable biblical criteria? 38 "For as in the days before the flood, they were eating and drinking, marrying and giving in marriage, until the day that Noah entered the ark, 39 and did not know until the flood came and took them all away, so also will the coming of the Son of Man be" (Matthew 24:38-39). 1 Beloved, I now write to you this second epistle (in both of which I stir up your pure minds by way of reminder), 2 that you may be mindful of the words which were spoken before by the holy prophets, and of the commandment of us, the apostles of the Lord and Savior, 3 knowing this first: that scoffers will come in the last days, walking according to their own lusts, 4 and saying, "Where is the promise of His coming? For since the fathers fell asleep, all things continue as they were from the beginning of creation." 5 For this they willfully forget: that by the word of God the heavens were of old, and the earth standing out of water and in the water, 6 by which the world that then existed perished, being flooded with water. 7 But the heavens and the earth which are now preserved by the same word, are reserved for fire until the day of judgment and perdition of ungodly men. Noah and his family planned. But what about all the official assurances we will be receiving in the end times that things are fine and/or under control? 3 "For when they say, 'Peace and safety! ', then sudden destruction comes upon them" (I Thessalonians 5:3). Sudden destruction will come--and that includes the USA (cf. Daniel 11:39; see also USA in Prophecy: The Strongest Fortresses). The Bible does not endorse hoarding up everything up for the last days or trusting in things like gold. Yet, that does not mean one should do nothing in terms of normal preparations. Ants gather up for a season. Christians should be prepared for seasons, as well as events that can reasonably be expected to affect where where they live. In our case, we are vulnerable to earthquakes as well as isolation as there is only one main highway in or out of our area. There are some backroads, but they would be hard for semi-trucks to drive across if they survived. Furthermore, a massive disaster that hits California would also likely affect the more densely populated areas of Northern and/or Southern California. Hence, our area (which is several hours away from each by truck) would not be as much of a priority for government emergency planners. Thus, our family has some food and water to last a week or two, in the event of a major earthquake or other disaster. And that is something that the government planners do encourage people around here to do--though relatively few do so. Christians should take some steps. "Come now, you who say, 'Today or tomorrow we will go to such and such a city and buy and sell, and make a profit'; whereas you do not know what will happen tomorrow...But now you boast in arrogance. All such boasting is evil. Therefore, to him who knows to do good and does not do it, to him it is sin." (James 4:13,16,17). Are not the peoples in the first world countries rich? We should be doing good--planning can be good. Does the Bible teach that we are to ignore problems? "Do not be deceived, God is not mocked; for whatever a man sows, that will he reap...Therefore, as we have opportunity, let us do good, for in due season we shall reap, if we do not lose heart" (Galatians 6:7,10). 16 "The lazy man is wiser in his own eyes than seven men who can answer sensibly" (Proverbs 26:16). "But be you doers of the word, and not hearers only, deceiving yourselves. For if anyone is a hearer of the word and not a doer, he is like a man observing his natural face in a mirror, for he observes himself, goes away and immediately forgets what kind of man he was" (James 1:22-24). And preparation certainly makes a lot of sense. One website (to which I have no affiliation whatsoever, nor from which have I ever bought anything) that has been suggested to me related to physical preparation is http://beprepared.com/ (but their are many others on the internet that have similar information). In 2008, there were temporary limits placed on buying rice in the United States (see Rice and the Beginning of Sorrows) and some Asian nations limited and even stopped rice exports for a while. Thus, this and more could happen again. There were various wheat shortages expected for 2010 (see Drought: Less Wheat in Russia, Europe, Australia, China, and Argentina). Back on August 5, 2010, Russia announced that it would be halting exports of grains. In some countries social order has already begun to break down in the face of soaring food prices and spreading hunger. Could the worldwide food crisis portend the collapse of global civilization? No country is immune to the effects of tightening food supplies, not even the United States. If China turns to the world market for massive quantities of grain, as it recently has done for soybeans, it will undoubtedly look to the United States, which dominates world grain exports. For US consumers, the prospect of competing for the US grain harvest with 1.3 billion Chinese consumers with fast-rising incomes is a nightmare scenario. It would be tempting for the United States to restrict exports, but this is not an option with China which now holds well over one trillion US dollars. Like it or not, US consumers will share their grain with Chinese consumers regardless of how high food prices rise. If the food crisis worsens, national restrictions on grain exports coupled with various bilateral arrangements could tie down much of the exportable supply of grain, making it increasingly difficult if not impossible for weaker, less affluent countries to find grain to import. Many countries heavily dependent on imports could be left out, and the result would be hundreds of millions of desperate people. Desperate people do desperate things: They riot, they fight over food, they overthrow governments, and they mass migrate to more food-secure countries. The massive amount of debt that Western nations have acquired somehow needs to be dealt with. And while at some point, leaders will restrict certain food exports, that will not guarantee that their people will have food (they may even need to import if their currencies are any good). If indebted nations restrict their food exports that puts them at risk of totally destroying their currencies, and cause other severe civil disruptions. These are dangerous times, even for the Anglo-American nations (see also Anglo - America in Prophecy). The German government told its citizens on Wednesday to stockpile at least a week’s worth of food and water in case of a serious attack or catastrophe, Reuters reported. It is the first time since the Cold War that Germany has enforced an emergency preparedness plan for the entire nation. “The population will be obliged to hold an individual supply of food for ten days,” read the 70-page plan, called the “Concept for Civil Defense”, prepared by the Interior Ministry. It also lays out precautionary steps for terror scenarios, chemical attacks, and cyber attacks, and outlines the demand for an effective alarm system which could notify citizens of emergencies. The plan suggests improvements on protection for buildings and emergency medical care as well. So, Germany wants its people to prepare. 5 And Jesus, answering them, began to say: “Take heed that no one deceives you. 6 For many will come in My name, saying, ‘I am He,’ and will deceive many. 7 But when you hear of wars and rumors of wars, do not be troubled; for such things must happen, but the end is not yet. 8 For nation will rise against nation, and kingdom against kingdom. And there will be earthquakes in various places, and there will be famines and troubles. These are the beginnings of sorrows. 9 But watch out for yourselves, for they will deliver you up to councils, and you will be beaten in the synagogues. You will be brought before rulers and kings for My sake, for a testimony to them. 10 And the gospel must first be preached to all the nations. 11 But when they arrest you and deliver you up, do not worry beforehand, or premeditate what you will speak. But whatever is given you in that hour, speak that; for it is not you who speak, but the Holy Spirit. 12 Now brother will betray brother to death, and a father his child; and children will rise up against parents and cause them to be put to death. 13 And you will be hated by all men for My name’s sake. But he who endures to the end shall be saved… Mark 13:3-13). Events seems to be lining up to fulfill the above and other biblical prophecies. But the end (meaning the great tribulation, which starts afterwards, see When Can the Great Tribulation Begin?) is NOT yet. Difficult times should get people's attention. National repentance is what is needed (though this looks unlikely for the UK, USA, and their Anglo-allies like Canada, New Zealand, and Australia). Some suspect that food riots may some day hit the United Kingdom (see Food Riots for the UK?). But a terrible hour of trial is coming first (Revelation 3:10; Jeremiah 30:7). But, the good news is Kingdom of God will come afterwards. 37 And what I say to you, I say to all: Watch!” (Mark 13:18-20,37). A period of persecution combined with successfully proclaiming the gospel to the world as a witness precedes the great tribulation (see also Persecutions by Church and State). And then the faithful church FLEES (see also There is a Place of Safety for the Philadelphians. Why it May Be Petra). Until then, Jesus says to watch and pray (Luke 21:26). The righteous obey God and take the steps that they believe God would want them to take, realizing that God will provide, even when that does not seem to be the case (cf. Genesis 22:8). Although those who trust in things on the earth will be disappointed, the wise may also wish to study physical preparation scriptures, such as Proverbs 6:6-8, as they are certainly in the Bible for a reason. The Bible tells of a coming time of death and pestilence (Revelation 6:7-8; Matthew 24:7-8). On a trip to Asia, I noticed that some Asian-appearing individuals (and only Asians, and then mainly women) were wearing masks to presumably reduce their risk of catching airborne diseases in airports and some other places. Washing hands and wearing masks sometimes do have limited benefit, and it is possible that in times of epidemic that some (though not all) may benefit from these actions. While proper preparation is good, some take this to extreme and overly trust in themselves. Others trust in technology. 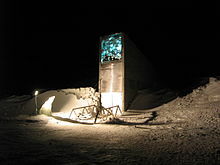 One solution for problems in the world is the Svalbard Global Seed Vault, also called the Doomsday Vault. The Svalbard Global Seed Vault in the remote Arctic is meant to be a “fail-safe” backstop against doomsday scenarios that could kill off humanity’s food supply. Located on an island between Norway and the North Pole, and lodged inside a mountain, the vault was designed to withstand major disasters, “natural or man-made,” and “stand the test of time,” according to its website. But as with much of the land above the Arctic circle, the mountain containing the vault--and all the land around it--is made of permafrost, the thick layer of compounded plants and animal bones that has been frozen since the last ice age. When ice and snow melts in the Arctic during summer, permafrost--theoretically “permanent”--does not. At least it did not, historically. But thanks to climate change, the permafrost now is thawing, releasing greenhouse gases while causing the land to subside and pools of meltwater to form on the surface. The people behind the seed vault’s perspective were not prepared for that when they built it in 2008. Scientists at the time were just beginning to understand what a threat global warming posed to the frozen layer. “It was not in our plans to think that the permafrost would not be there and that it would experience extreme weather like that,” Hege Njaa Aschim, a spokeswoman for the Norwegian government agency which manages the vault, told the Guardian. Popular Science spoke with Cary Fowler, one of the creators of the vault to see just how serious the situation really is. “Flooding is probably not quite the right word to use in this case,” he told them. According to Fowler, a little bit of water has made its way into the entrance every year. Though he wasn’t present at the vault when the ‘flooding’ occurred this year, he insists that it’s a pretty routine occurrence. “The tunnel was never meant to be water tight at the front, because we didn’t think we would need that,” he tells Pop Sci. Basically, there’s a 100-meter tunnel that serves as a walkway into the mountain and it goes downhill. Before you reach the vault doors, the ground shifts uphill. This little area allows water to collect and two pumps can evacuate it. Hege Njaa Aschim, a Norwegian government official, told the Guardian, “A lot of water went into the start of the tunnel and then it froze to ice, so it was like a glacier when you went in.” And well, that’s not really a crisis. In fact, according to Fowler, if the water were to make it all the way uphill it would get hit with temperatures around minus 18 degrees celcius, freeze, and create a new barrier. The Svalbard Global Seed Vault did not anticipate this problem. There are also others they have not considered. The Doomsday Vault: Humanity’s salvation? On the Arctic tundra in Svalbard, Norway, about half-way between Oslo and the North Pole, there are no gardens, no trees. Yet, deep beneath this barren surface lies the largest concentration of agricultural diversity anywhere on Earth. The angular, concrete structure seems more “modern art museum” than “seed storage vault.” It impresses even before entering. There are 1,700 seed banks worldwide of varied size and state of repair. But this one in Norway is known as the “Doomsday Vault.” It’s a back-up for the whole system designed to last for thousands of years. So, for instance, when a typhoon tore through a seed bank in the Philippines, destroying everything inside, all was not lost. Or when war destroyed seed banks in Iraq and Syria, the seeds were safe here. “We protect, yes, against some of the natural disasters — war and civil strife and hurricanes and floods and fires,” Fowler said. “But we also protect against anemic budgets and budget cuts and stupid human mistakes as well." . . .
“I think a lot of people would say, ‘Wow, this is incredible that there are all of those seeds up in Svalbard, good idea, but it probably doesn’t really affect me, personally,’” Doane said. “Oh, I think it clearly affects everyone,” said Cary Fowler. “I mean, we’re losing right now something like $160, $170 billion a year just in our wheat crop globally, just because of the temperature anomaly that we have in the world, the hotter temperatures. So we’re going to need, and plant breeders are working on, heat-resistant varieties. The CBS article did not mention anything about genetically-modified seeds which are something that place the world at risk for major crop failures and possible famine. I continue to believe that likely crop failures associated with GMO grains are putting the USA at extreme risk of being destroyed economically and otherwise (and most USA corn and soy crops come from genetically-modified seeds). Many other parts of the world are vulnerable to this as well–though Europe continues to resist this (see European nations say NO to genetically-modified corn). 4 And Jesus answered and said to them: “Take heed that no one deceives you. 5 For many will come in My name, saying, ‘I am the Christ,’ and will deceive many. 6 And you will hear of wars and rumors of wars. See that you are not troubled; for all these things must come to pass, but the end is not yet. 7 For nation will rise against nation, and kingdom against kingdom. And there will be famines, pestilences, and earthquakes in various places. 8 All these are the beginning of sorrows. (Matthew 24:4-8). The “beginning of sorrows” (Mathew 24:7-8) begins before the Great Tribulation (Matthew 24:21), the time of Jacob’s trouble (Jeremiah 30:7). We seem to be in the beginning stages of these sorrows. People did not believe God that there would no longer be an earth-covering flood (Genesis 9:11-17). People were afraid so they came up with their own alternate plan. But it was unsuccessful (cf. Genesis 11:5-9). While having natural seeds preserved is logical and can help, seed vaults are not humanity’s salvation. While having seeds protected can make sense, we need Jesus’ return. While making physical preparations can be wise (cf. Proverbs 22:23; 30:24-25), those who think that they have considered being prepared for all possible emergency situations that will occur are deceiving themselves. This does not mean that no physical preparations should be made: but they will not provide salvation. The above promise of protection was only made to the Philadelphian Christians, yet is was not made to the other churches of Revelation 2 & 3. NOT ALL CHRISTIANS WILL BE PROTECTED DURING THE COMING GREAT TRIBULATION. Christians should watch world events and realize their biblical ramifications. They should pray to be accounted worthy to escape what will come to pass. This means that in these times that they need to strive to be a Philadelphian Christian. Relying on seed vaults, etc. is not the answer. Get your spiritual house in order. There are also modern problems that the world faces that were unheard of a century or two ago as the world is more and more dependent upon electricity. PHOENIX -- State lawmakers are moving to make sure you know what to have on hand when electronic Armageddon strikes. Legislation approved Wednesday by the Senate Public Safety Committee would require the state Division of Emergency Management to come up with recommendations about what kinds of things Arizonans should buy now and store in the garage, basement or storage room just in case some enemy detonates a nuclear or other bomb that wipes out power and communications in the state -- and possibly nationwide. That recommendation also would spell out exactly how much food, water and medical supplies should be available to last for weeks or months. And the state agency would have to updated that list every five years. SB1476 is being pushed by Sen. David Farnsworth, R-Mesa, amid concerns about an electromagnetic pulse that can be caused by certain types of explosion. Lawmakers were given no indication of what it would cost the state agency to come up with that list of necessary supplies. But they were unanimous in their approval. In fact, some suggested the legislation does not go far enough. Sen. Chester Crandell, R-Heber, said it isn’t simply a matter of individual survival. “There’s a lot of different organizations we have in the state that actually work for the public safety,” he said, including agencies like the Department of Public Safety or even utilities that need to provide power for everything down to the plant that purifies and pumps water. He said maybe state emergency officials need to be figuring out -- and telling them -- what they need to have on hand. “If we’re looking at a nationwide, or at least a statewide catastrophic (situation), all the power goes out, trucks stop running, this whole thing, how are they going to then carry out their duties and responsibilities for public safety?” Crandell asked. Sen. Andrea Dalessandro, D-Green Valley, said she understands in a small way what can happen when unexpected disaster strikes, having lived in New Jersey. “Sometimes we would have regional blackouts for several days,” she said. There are many risks to the current world order. Well, preppers are correct that disasters are coming. A building network of backwoods doomsday camps around the country are pulling in members from affluent areas and even Washington national security officials as the threats grow from nuclear war, an EMP or virus attack. Called Fortitude Ranch, the outposts promise protection and a year’s supply of food for those unable to build their own bunker. What’s more, until a crisis strikes, they are being used for prepper training and vacations. “We’re seeing members from all the three letter agencies,” said Fortitude creator Drew Miller, a retired Air Force colonel and intelligence officer, in a reference to the Central Intelligence Agency, Defense Intelligence Agency and Federal Bureau of Investigation. He called an attack or even a weather-related electromagnetic pulse shutdown of the electric grid “inevitable,” and a driving force in his project. There have been numerous reports recently warning of EMP, nuclear and viral attacks from Russia, Iran and North Korea. Are there real risks to the USA? Might some government officials know more about some risks than the general public? Might being in a ‘doomsday shelter’ possibly provide any protection from certain rough events? Will US President Donald Trump be able to stop the USA from being taken over during the Great Tribulation? Will going into any doomsday shelter be the ultimate or preferred protection during the time of the Great Tribulation and Day of the Lord? NOT ALL CHRISTIANS are promised this protection--per Revelation 12:14-17. Now, preppers are correct that people are foolish to think that the government will be able to help them when things get really bad. Preppers are right that it is wise to prepare for emergencies and disasters. Preppers are right to conclude that they should be able to 'live of the grid' in the event of massive electrical shortages that could be triggered by solar flares, electromagnetic pulse bombs, or other natural and manmade phenomena. Essentially, they believe that if they have some type of difficult to penetrate shelter (bunker), food, water, filtration system, medicines, guns, etc. that they will be able to take care of themselves and be fine. But most preppers who think that they will safely ride out the Great Tribulation are basically deceiving themselves. They correctly believe that by having such things that they will reduce the strain on whatever a government may or may not be able to supply in the event of a massive disaster. It is not that none will survive the Great Tribulation and the Day of the Lord, but it will be worse than they anticipate. Some preppers believe that they will be able to survive in various locations in the USA. Some preppers believe that they will survive in the mountains of Australia. New Zealand is remote and its South Island has a lot of mountains, some of the rich are looking there (see Buying a ‘place of safety’ in New Zealand is ignoring what the Bible teaches). Still others look to the UK or to remote regions of Canada. He said: “People need to know there are possibilities for their children -- that they will have the same opportunity as anyone else. Is New Zealand A Doomsday Preppers' Paradise? Of course, the wealthy have many options for doomsday preparedness, as we’ve noted time and time again - from personal bunkers to memberships to luxury post-apocalyptic communities. There’s little dispute that belief that the end times - or at least a massive civilizational collapse - are looming just over the horizon as some of the social fabric underpinning society unravels, and economic inequality skyrockets - reinforcing the idea that those who survive will be those who can afford it. f you’re interested in the end of the world, you’re interested in New Zealand. If you’re interested in how our current cultural anxieties – climate catastrophe, decline of transatlantic political orders, resurgent nuclear terror – manifest themselves in apocalyptic visions, you’re interested in the place occupied by this distant archipelago of apparent peace and stability against the roiling unease of the day. New Zealand will one day be taken over--it will not be the ultimate place to ride out the Great Tribulation. Why are the global elite buying extremely remote compounds that come with their own private airstrips in the middle of nowhere on the other side of the planet? And why did they start dumping stocks like crazy earlier this year? Do they know something that the rest of us don’t? The things that I am about to share with you are quite alarming. It appears that the global elite have a really good idea of what is coming, and they have already taken substantial steps to prepare for it. Sadly, most of the general population is absolutely clueless about the financial collapse that is about to take place, and thus most of them will be completely blindsided by it. . . . The following comes from the Daily Mail . . . The country is 11,658 miles away from the UK, while its closest neighbour is Fiji -- 1,612 miles away, more than double the distance between Lands End and John O’Groats. Homes at the top end of the market come with tennis courts, swimming pools and media rooms -- and some even boast their own personal jetties where a family can moor their boat. But we should all be getting prepared. Reddit CEO Steve Huffman, Sam Altman of Y Combinator, Trump-loving Peter Thiel -- the list goes on -- are all preppers. Hoffman estimates that “50-plus percent” of other tech billionaires have a home to escape to. Some have claimed that Donald Trump’s election was a signal to move to New Zealand. A while back, I also saw an article listing the ten safest places to wait out World War III (see 10 safest nations to be in during World War III? Has WWIII begun? ), and I did a video about that (watch 10 Safest Nations to be in During WWIII)--yet, since the article did not rely on the Bible, its author(s) overlooked many matters. 19 They pursued us on the mountains And lay in wait for us in the wilderness (Lamentations 4:19). The above indicates that some will be hiding in the mountains and other places in the USA while others are will be taken out of the USA (which is the prophetic Samaria--see Spiritual Samaritans: Old and New). Most of the Anglos that are not killed will be made slaves. Hiding in the mountains may protect a few for a time, but it will be relatively few that survive that way for long. But didn't Jesus teach to flee to the mountains? Now this does not mean that Jesus expected one to go to a stocked bunker. Only that those in Judea who have not fled before they see the abomination will not have time to do anything then but flee. In time, any who are Philadelphian Christians will go elsewhere (see also There is a Place of Safety for the Philadelphians. Why it May Be Near Petra). Mormons tend to believe that they need to have a year's supply of food on-hand, yet that will not be enought. The Bible tells of a place of protection for Philadelphian Christians and that is in a wilderness area, apparently in the Middle East. The mountains of the USA. Australia, New Zealand, Canada, and the UK will not really be a place of protection for many--the place of protection for the Philadelphian Christians will be elsewhere (see There is a Place of Safety for the Philadelphians. Why it May Be Near Petra). As far as preppers go, while those biblically-inclined may wisely point to scriptures like Proverbs 6:6-11; 30:24-25 to consider the ant and prepare. Preppers, however, may also wish to consider what happend to the wildfire group called the Granite Mountain Hot Shots. In 2008, a fire a fuels mitigation crew, after much training became the first municipal wildfire team to be awarded the "Hot Shots" designation by the US Federal government. The crew then named itself the Granite Mountain Hot Shots. They trained and prepared, not only to essentially "fight fire with fire," they also had equipment and training to help the crew survive in case it became trapped before a fast-moving brush fire. They 'prepped' for it, in case such a situation would occur. As it turned out, there was a fire in the area, now called the Yarnell fire. It was bad. Other fire crews left a dangerous area. It was time to 'flee,' if you will. However, the Granite Mountain Hot Shots decided that they had more time. So, they decided to work to try to stop the fire from reaching an area. After working a short while, they realized that they should have fled earlier. One of the things that the Granite Mountain Hot Shots prepared for was such an emergency. They apparently cleared some brush to slow the fire down, then in the clearing, they donned indvidual portable fire shelters. Shelters that only took them seconds to set up in training, and probably only took that long in this situation. They trusted that their shelters and training would protect them. On June 30, 2013, 19 members of the group were killed fighting the Yarnell Hill Fire. ... The firefighters had apparently deployed fire shelters, but not all of the bodies were found inside them. According to the National Fire Protection Association, it was the greatest loss of life for firefighters in a wildfire since 1933, the deadliest wildfire of any kind since 1991, and the greatest loss of firefighters in the United States since the September 11 attacks. The firefighters were burned up. Preppers, accurately, believe that they should have training and prepare for disasters. They trust their training and their equipment. So did the Granite Mountain Hot Shots. Thus, while certain levels of preparation for disasters is logical and biblically-correct, most of those who believe that they will be able to ride out the coming Great Tribulation and Day of the Lord are deceiving themselves, as did the Granite Mountain Hot Shots. There will be a time to flee (e.g. Matthew 24:15-20; Jeremiah 51:6; Zechariah 2:6). Yet, many will not realize it--including many Christians (cf. Revelation 12:17). The gathering is to take place will before the day of the Lord (which happens about 2 1/2 years after the Great Tribulation of Matthew 24:21 begins) and before some type of decree is issued. The most faithful end time Christians. The above is a reference to Christians as they are to be the "meek of the earth" (Matthew 5:5) and to Philadelphians who "have upheld His justice. Seek righteousness, seek humility." These are Philadelphian Christians who understand that church leaders need to have integrity and are willing to be humble enough to accept the authority of a church led by a low-level prophet in the absence of a clear apostle (cf. 1 Corinthians 12:28; Ephesians 4:11-15). They are humble enough to not think that they should remain 'independent,' as many Christians, such as those who once were part of the old Worldwide Church of God have done. So, it is those who have taken the prepatory step to "gather together" that may be protected from what is coming. By the way, the Bible shows that God is displeased and/or angry with the Sardis and Laodicean Christians at the end (Revelation 3:1-6; 3:14-22). For they are the only ones who will actually 'gather together' as they should. A decree will be issued that may allow those who are gathered together and who listen to it an opportunity to be protected (Zephaniah 2:1-3). A decree that the Philadelphians will listen to and fly/flee. Those who gather together to support the end time Philadelphian work (Revelation 3:7-13) are the only Christians promised protection during the "hour of trial that which shall come upon the whole world" (Revelation 3:10). And they, unlike the Laodicean Christians (Revelation 3:14-22), will have gathered together in time. The Granite Mountain Hot Shots did not gather together with the other firefighters when they should have. They were in error. Most Christians in the end times will be in error as well (cf. Revelation 12:17). We should be reasonable, but need to understand we need to trust God more than our physical prepartions. What About Gold, Silver, etc.? Despite what you may have heard, gold and silver may not be all that good as inflation hedges. In times of economic turmoil, governments often confiscate their citizens' gold. "They shall cast their silver in the streets, and their gold shall be removed: their silver and their gold shall not be able to deliver them in the day of the wrath of the Lord: they shall not satisfy their souls, neither fill their bowels: because it is a stumbling-block of their iniquity" (Ezek. 7:19). You cannot eat gold. You must buy it retail and sell it back wholesale. You may have to pay assay charges. You can't buy in quantities of less than an ounce, and so, in times of social breakdown, how would you pay for a loaf of bread? By clipping off a piece of your Krugerrand? Decades later, a former Global Church of God minister once mentioned that having a few gold or silver coins around could be helpful in the time of the end. That may well be true, but if so, since the Anglo-American governments will be toppled in the Great Tribulation, coins from other than the USA, Australia, Canada, New Zealand, and the United Kingdom would seem to be a wiser choice. Many believe that the Anglo-American nations will inflate their currencies so much, that this will mean that they will have little if any value in the future. And sadly this is correct (see also Anglo - America in Prophecy). This will mean that they will be able to import little, if any food, should they have significant weather, pestilences, or other massive issues with their own food supplies. Many advocate gold, silver, and/or other precious metals as a hedge against this. And while I am NOT a "gold bug," it is true that the Bible shows that gold and silver will have value into at least part of the Great Tribulation--but it may well drop in value before then. 40 ... the king of the North ... 43 He shall have power over the treasures of gold and silver, and over all the precious things of Egypt (Daniel 11:40, 43). The Great Tribulation actually would start by the end of verse 39 of Daniel 11, so obviously Daniel 11:43 is after that. If gold and silver were of no value then, then they would not be precious (see also Zechariah 14:13-14) to the King of the North. Revelation 18 also confirms that gold will have value during the time of the Babylonian beast power (cf. Revelation 18:12). However, this does not mean that owning some may not help a little bit, but that a relationship with God counts much more. For more scriptures, as well as technical information about gold, please see the article The Plain Truth About Gold in Prophecy. How Should a Christian View Gold? As one familiar with statistics, there is a concept known essentially within the framework of "game theory" which in essence states, look at the end result and not always at the probability for occurrence. Regarding a food shortage, let us assume that there is a 99% probability that nothing truly significant will happen this year or next. Let us assume you do nothing. If nothing happens, you will feel vindicated. If something does happen, you may be impoverished or worse--you will also contribute to the panic that would ensue for those who also did not prepare. 35 "It is more blessed to give than receive" (Acts 20:35). Remember, if you do not prepare early enough, you will hope that others will help you. I would rather have it and not need it than need it and not have it. What does any of this have to do with game theory? Simply this, that even if the probability of an occurrence is low, the consequences of each probability needs to be weighed. Or in the vernacular, it is better to be safe than sorry. There is probably a 99% probability that if you do not look both ways before crossing a street that you will not be severely injured. But most people realize that they should look before crossing a street. Disasters are coming--Jesus said so (cf. Matthew 24:4-29). God will not give up on you--but God expects you to do your part. Some believe that they know the safest places to flee to or to be in when trouble comes (watch 10 Safest Nations to be in During WWIII), but biblically most are in error. I should state that I do not believe we in the Western nations will need to flee this year, I do believe that according to scripture, the Great Tribulation cannot begin before 2022. But we now seem to be in the time that Jesus referred to as "the beginning of sorrows" (Matthew 24:4-8), and preparation during this time appears wise. As I wrote much earlier about y2k, I suspected that the y2k rollover would not be the actual test, but perhaps a pretest to see who would prepare. I would also add, however, that those who believe that they can personally prepare physically to ride-out the Great Tribulation and Day of the Lord are likely deceiving themselves as there will be many problems that they will not have been able to anticipate, nor do I believe that Christians should be so focused on physical protection that they trust in themselves. But there is still value in preparation. I suspect that because y2k and various storms did not lead to major long-term problems in Western nations, some Christians will not flee when it's time (for a related article, please check out Laodicean Warning for God's People and There is a Place of Safety for the Philadelphians. Why it May Be Petra). The Bible seems to make it clear that it is prudent for Christians to take a few essentially no-risk preparations. After all, if as Jesus said, "you are of far more value than many sparrows" (Matthew 10:31), shouldn't we prepare at least as much as ants? Consider the ant, but also remember the Granite Mountain firefighters. While gold and silver (nor guns) will not provide salvation, they are likely to outlast the value of the US dollar. And while I do believe that hardly anyone will survive in places like the USA/UK/Canada, etc., because they hope to have a 3 1/2 year supply of food, it is prudent for people to have reasonable amounts of stored food and water so that they can survive for several weeks at least (as well as to possibly be able to help neighbors and others survive). Therefore, I believe that some physical preparations are wise in these end days, but only with the realization that God is our protector and only He can protect from what is coming (and He has made such a provision, please see There is a Place of Safety for the Philadelphians. Why it May Be Petra).